The Blu-ray treatment is superb for this never-before-released-on-DVD biopic, but it's too bad the movie's not better. 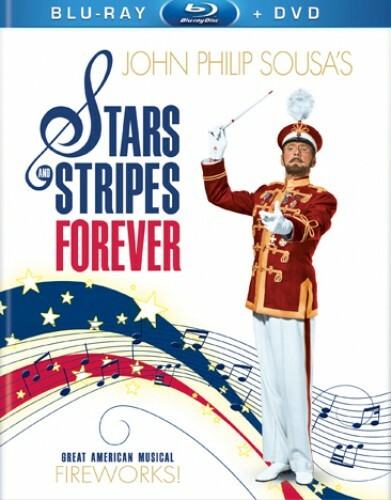 John Philip Sousa occupies an undeniably important place in American music history, and Henry Koster's 1952 Technicolor biopic makes sure we don't forget it, stamping it on our collective brains with a worshipful portrait that doesn't end with the film's occasional fawning narration. These days, biographical films, especially those about artists, tend to be wearying foil-stamped templates, dotted with object lessons about the seductive pleasures of booze, drugs, and miscellaneous other vices. Somehow, one can't see "March King" Sousa falling prey to anything so crass; in fact, the composer's life was ostensibly so normal, Koster and screenwriter Lamar Trotti must have decided it was devoid of conflict altogether. Thus, utterly reverent and deadly dull, Stars and Stripes Forever plods along, infused with an ill-fitting subplot about fictional young lovers in an attempt to stir the pot. The film begins with Sousa (Clifton Webb) as a sergeant major in the Marines, where he acts as bandleader, a position he held for 12 years near the end of the 19th Century. A respected leader and family man, with a wife (Ruth Hussey) and three kids at home, Sousa begins to think about a musical career away from the military thanks to a spunky recruit (Robert Wagner) and his girlfriend (Debra Paget). Sousa goes on to create the touring Sousa Band, where his patriotic marches and songs are brought to the masses around the country to great success. It's a thin narrative arc, and it takes a great deal of padding to reach the 90-minute mark, with extended performance marches played ad nauseum and the romantic trials of Wagner and Paget, which demand the focus of the film often. Not that any interesting relational ground is breached here -- one of the couple's greatest conflicts is having to hide their marriage from Sousa, who forbids his musicians to travel with their wives. Webb's noble, almost magisterial portrait of Sousa is a fine performance, but unless one is an avowed fan of the composer -- or the kind of person who sits and down and listens to recordings of marches for pleasure -- Stars and Stripes Forever will likely be a bit of a slog. Having never before released the film on DVD, Fox gives Stars and Stripes Forever a handsome Blu-ray/DVD combo pack. (Sorry DVD folks, there's no standalone DVD release.) Presented in 1080p high definition in it is original aspect ratio of 1.37:1, the rich Technicolor hues look pretty outstanding, presenting vibrant colors and no apparent signs of color bleeding due to Technicolor degradation. The image is consistently sharp and damage-free. Although film-like grain is almost nonexistent, it doesn't appear to be the result of excessive noise reduction -- the textures here look reasonably film-like. Audio is presented in a mono DTS-HD track that handles the film's numerous marches and musical moments quite nicely, with bold, clean sound emanating from the front channel. Dialogue is similarly clean and crisp. In what is presumably a crop of newly produced bonus material, Fox gives us two featurettes on Sousa's career -- one on the film adaptation, the other on his contribution to American music -- featuring interviews with a number of historians and Sousa enthusiasts. Also included is the UK alternate opening, which features the title Marching Along, after Sousa's memoirs, on which the film was based. Curiously, this sequence is in black-and-white. On the disc are galleries of press material, advertising and film stills along with the U.S. and UK trailers. Contrary to the packaging's information, these extras are included on both the Blu-ray and the DVD discs. Also included in the package is a booklet with an essay on the film and brief bios of the cast and Koster. Any Technicolor film from the 1940s or 1950s given a Blu-ray release is cause for celebration, but surely Fox has better films in its vaults to give this kind of impressive treatment to. Win a copy of Stars and Stripes Forever from Cinema Sentries--find out how.